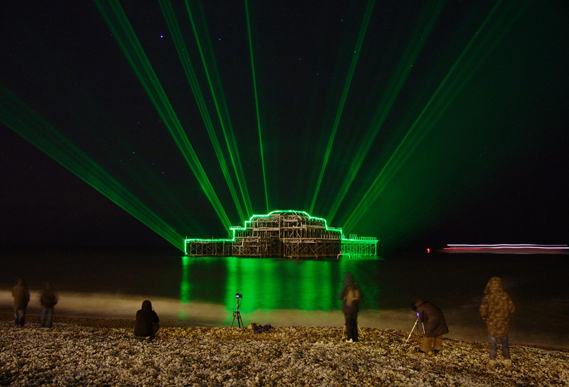 Architecture Zombie: Brighton’s Burned-Down West Pier Rises From the Dead…With Lasers! Brighton, England’s 1,115-foot-long West Pier has had a tough run lately. Built in 1866, it closed in 1975 and was burned to a crisp by a series of fires in 2003 (arson, say the experts). Plans to rebuild it have been batted around for years, but they’ve always been too expensive. The most ambitious of which includes a 600-foot-tall observation tower called the i360, designed by Marks Barfield, the firm behind London’s Eye. It’s under construction, but moving slowly. That’s Brighton’s design problem: How do you turn a pile of charred lumber 1,000 feet out in the ocean back into the civic landmark it once was, without actually building anything? Answer: Lasers. Buildings that incorporate light art into their facades are the latest trend, but let’s not forget about the original augmented architectural reality: illuminated buildings. 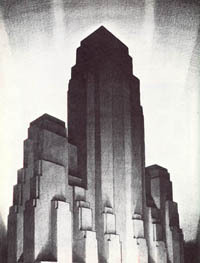 Starting with Edison’s Tower of Light for the 1893 World’s Fair in Chicago, the early 20th century was a golden age for lit-up buildings–just look at Hugh Ferris’s awesome drawings of 1920s New York (eat your heart out Tim Burton–this is real Gotham). 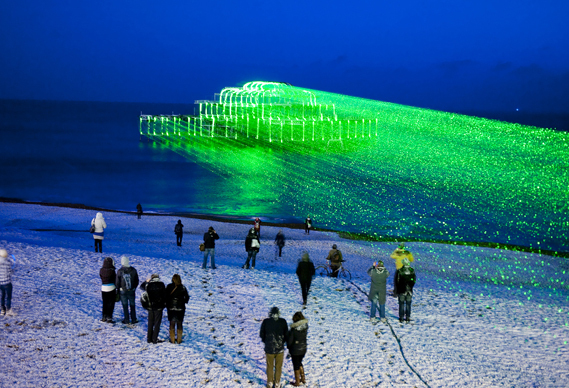 So the roots of “A Pier/Appears” go deep, even though it might seem just a Floyd song away from a laser light show.